Situated in Upper Sheringham, approximately 20 miles from Happisburgh, Sheringham Park is the brain child of the acclaimed landscape gardener, Humphry Repton (1752-1818). After attempts at making a living as journalist, artist, confidential secretary, dramatist, political agent, and textile merchant, Humphry Repton hit on the idea to combine his two greatest skills, sketching and gardening, and to become a landscape gardener – a term coined by Repton himself. In 1812, Humphry Repton was commissioned by Abbot and Charlotte Upcher to design their newly purchased estate, and his son, the architect John Adey Repton (1775-1860), was engaged to design their new home, Sheringham Hall. Now owned and lovingly maintained by the National Trust, Sheringham Park is famous for its luscious display of rhododendrons in early summer. It was Thomas Upcher (1905-1985) who developed this stunning collection of more than 80 species of rhododendron. And it was Thomas who, in 1975, erected the Temple, which had been included in Repton’s original plans for Sheringham Park. In springtime, the heady scent of bluebells fills the woodland, and the parkland is bright with buttercups; swallows, chiffchaffs, and sand martins return to take up their summer residence; frogs and toads make their way back to their ponds to breed; and adders bask in the first warmth of summer. If you’re feeling energetic, we recommend the long climb to the top of the viewing tower for a panoramic view of the surrounding countryside and the North Sea. From this dizzying height, you’ll see the magnificent wind farm, 11 miles out at sea, the steam railway (Poppy Line), the lush green golf course, patches of woodland, winding roads, clusters of buildings – and below you, a colourful cloud of rhododendrons. You could spend all day roaming around this 1,000-acre paradise, or, if you prefer, there are four waymarked routes to follow. Many pathways are suitable for prams and wheelchairs, and there is even a free charging point for electric wheelchairs. 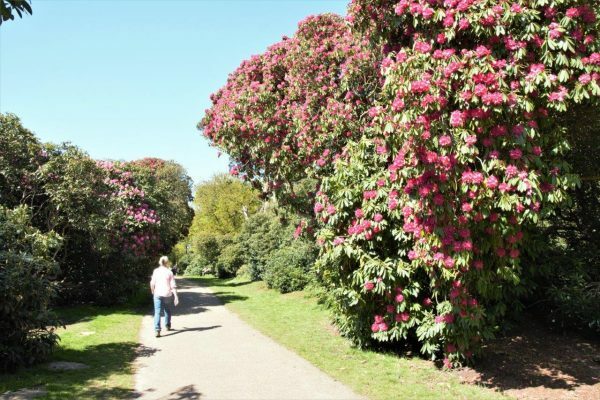 On 15th May, 22nd May, 29th May, and 5th June (all Tuesdays), you can join Sheringham Park’s head gardener for a guided Rhododendron and Wild Garden Walk. Sheringham Park has a large carpark, café, gift shop, and toilets. Dogs are welcome, as long as they are kept under close control. Although Humphry Repton didn’t live to see all his plans materialise, he declared that Sheringham Park was his favourite work. Holt Country Park, a few miles to the west of Sheringham Park, is a lovely place to visit with children. Owned and managed by North Norfolk District Council, Holt Country Park is open every day. There’s an exciting children’s play area with picnic benches nearby, a visitor centre, toilets, cheap parking, excellent disabled facilities, and five waymarked routes, which are all suitable for prams and wheelchairs. There are also wild ponies! In May and June, look out for the great spotted woodpecker, and also the goldcrest, a tiny bird that weighs in at only six grams, sharing (with the firecrest) the distinction of being the UK’s smallest bird. The really good news for our Boundary Stables visitors is that Holt Country Park is definitely a dog-friendly zone!